Matt Bean, who became VP and editor-in-chief of Rodale’s Men’s Health last September, doesn’t need to be sold on the wisdom of the 30-year-old magazine’s tradition of practicing a disciplined, sales-driven approach to covers. 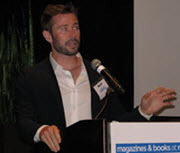 Bean held key print and digital editorial roles spanning Men's Health and other brands during his first tenure at Rodale from 2004 to 2012, and subsequently at Time Inc.--including editor-in-chief of newsstand staple Entertainment Weekly. Also, before switching his career path to media, his pre-med undergrad work at the University of Chicago included doing studies in the field of cognitive psychology, he related during a presentation at the 2017 MBR Conference. “That’s not the main [headline] or sell, because it won’t appeal to many in our audience, but it’s going to kill with that 20% that we’re looking to convert to the magazine,” Bean said. Bean says he’s upbeat not only about Men’s Health, but the general outlook for quality magazine brands. And that’s because of, rather than in spite of, digital media. “I think mags are uniquely positioned in this day and age,” he said, because of the often overwhelming barrage of texts, calls, emails, videos and podcasts. “I don’t know about you, but a lot of times, when confronted with digital media, I have the urge to go into the woods and take up cabinet making for a living,” he half-joked. ‘I want to do something tactile, that I can wrap my hands around, and feel like I’ve accomplished something at the end of the day. Well, that’s exactly what a magazine offers. You can pick it up and feel deeply in your bones that those editors have pulled the best of the world that month for you and put it in your hands. When you’re finished with it, you have the satisfaction of knowing you’ve completed something. I don’t get that with Facebook,” where new posts are never ending, he said. “I encourage you to think about that: There is a value to magazines that has never been as relevant to the reader,” Bean urged. At Men’s Health, “we’re really trying to emphasize that we’re filtering that confusing world for people,” he added. The magazine’s readers are “guys with a high household income, with an average age of around 40. What unites these guys most is not that they want to lose 10 pounds, but that they’re successful. So we edit it to be a magazine that helps them optimize every aspect of their lives, [including] relationships and how they dress. “Another quality we want to increase in the magazine is authenticity, because social media have fundamentally changed how we communicate with each other,” Bean said. “Anyone on Instagram is a publisher now. In the digital world, “like most companies, we’re trying to solve for mobile,” Bean reported. “Mobile is a big challenge for us, because it represents 80% of our digital audience, but there’s less inventory there to remind them about the magazine and the books and other things we sell. “We’re trying to create a virtuous circle where the magazine can drive people to the app and vice versa,” Bean continued. “There’s often talk of cannibalization of print by putting content in a digital format. I don’t see it that way. I think that if someone wants to use digital, they will—and if we don’t provide it to them, somebody else will. You can’t ignore it.